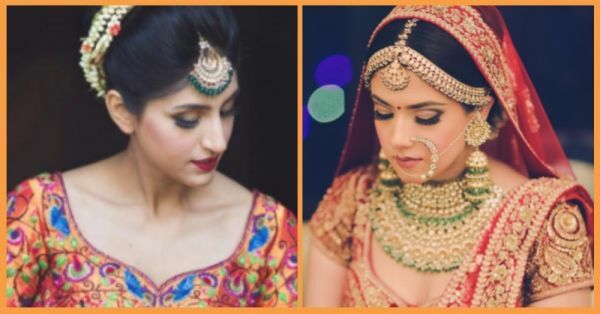 10 Brides Who Wore Traditional Yet *Edgy* Bridal Jewellery! We just can’t get enough of this matha patti and the earrings with a tassel twist! This could be a perfect look for your mehendi if it’s a morning function. We love the contrast of the traditional red lehenga with the green-hued polki studded jewellery. It looks royal and chic at the same time. The matha patti is just so pretty, isn’t it? 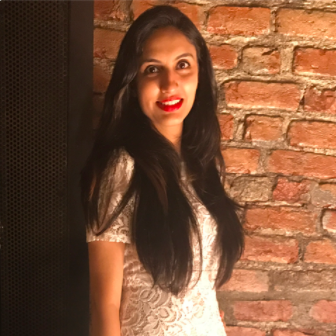 ‘Simple looks best’ seems to be this gorgeous bride’s motto. Her beautiful magenta and yellow outfit teamed with minimal gold jewellery is like a fresh wave among all the heavily decked up brides. Usually, such heavy jewellery with an equally heavy dress spoils the look. But surprisingly, it worked out pretty well for this beautiful lady. The gold and kundan neckpiece with the matching maangtika are just all in perfect sync and making the bride look oh-so-pretty! Very few people can pull off such a heavily dressed up look with elan and this bride totally nails it. Her jewellery is to die for, it’s absolutely stunning! But before you go for it, make sure you can handle its weight and also that it matches well with your dress. Even if we do not look at the cutie doggy in the picture (which is NOT something we can ignore btw), this picture is such a treat to the eyes. Mainly because of the gorgeous bride’s hatke lehenga and her maangtika of course. The bluish green beads add that perfect finishing touch to the outfit. Nothing soothes the eyes more than subtlety. And this charming bride, with her gorgeous bubble gum pink lehenga, her minimal peach-toned makeup and her cutesy nath, are #bridalbeauty goals at another level. Pearls have a certain royal touch to them that can up your style game instantly. And if you are the bride, just like this twirling beauty here, then you can definitely add a pearly touch to your jewellery for that elegant look. Kundan jewellery is every bride’s comfort zone. It is like that one option which nobody can ever go wrong with. And the best part? It is available in so many designs and patterns that you might as well be spoilt for choice.